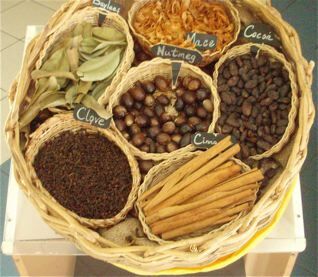 Grenada, part of the Grenadine islands, has long been called the Isle of Spice or the Spice Island, however, its biggest business today is really tourism with a nod to its heritage as a spice & herb producing & processing island. 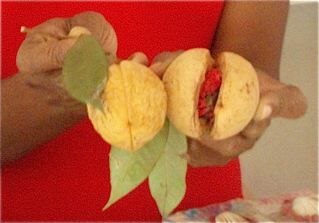 Historically, Grenada has been the second largest producer of nutmeg in the world (after Indonesia). The nutmeg pod is at the 8-9 o’clock position in the basket, while the cinnamon sticks in the center of the basket are actually approximately 10″ long. Cacao pods and bay leaves are at the 12 o’clock and 1-2-3 o’clock positions. Ravaged in the past decade at least twice by very devastating hurricanes (Ivan in 2004 and Emily in 2005), Grenada continues to struggle to recover. Spice bearing trees don’t grow overnight–it takes years before saplings reach maturity and again begin bearing sufficient crop to enable increased harvesting and export. Photo courtesy of Grenada Board of Tourism display taken with permission at the port Visitor Welcome Center. Nutmeg trees are once again reaching maturity with fruition, and we were told local farmers can bring their nutmegs to one of 16 receiving stations on the island. Reportedly, from there, after the nutmegs have been sorted and any defective ones removed (they are sent on to an oil distillery in Sauteurs), the nutmegs travel on to one of 3 nutmeg processing stations on the island. There, the nutmegs (still in their shells) are given the “water test” and those with higher oil content will be aged for culinary use and the others will be sold off to the cosmetic and pharmaceutical industries. The rich volcanic soil in the hills is what enables such trees to grow so well there. Smaller scale businesses have cropped up and some long standing businesses have managed to survive on a smaller scale. At this time, primarily cacao trees, bay trees, cinnamon trees and nutmeg trees (source of nutmeg and mace) grow in varying quantities scattered around the island. Some cloves are also grown & processed there. Cacao trees produce a large yellow fruit that is harvested in order to obtain the central cacao ball that contains the seeds. 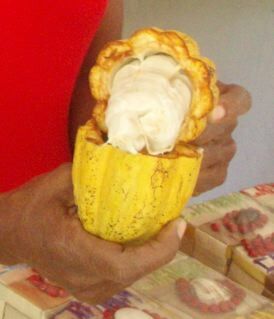 The photo shows a yellow cacao pod that has been cut open to reveal the inner ball of seeds that is encased in an off-white protective coating. 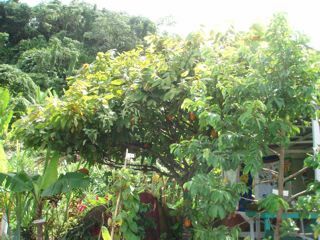 Another photo shows a cacao tree being grown by a family on the island. Many smaller family homes on the islands up in the hills grow various spice trees in informal naturalized garden settings. Some have small stands that might appeal to tourists doing island tours by private cab. Islanders take roasted cacao that has been ground up and shaped into a ball and then roll each one in ground nutmeg, ground bay leaves, and ground cinnamon bark and then place each ball into boiling liquid to make island cocoa. 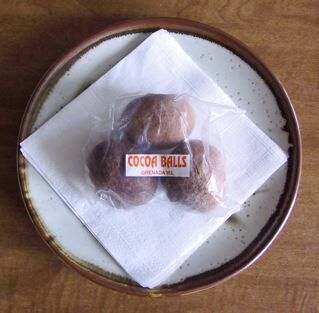 1 cocoa ball is dropped into 3-5 cups of water which is brought to a boil; after 5 minutes of boiling, the mixture is strained and the islanders add milk and sugar to taste. 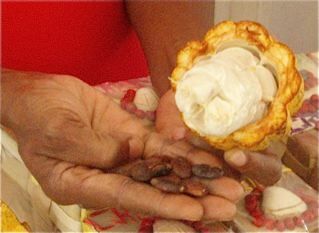 To flavor cakes, icings, and ice cream, islanders will grate some of the coated cocoa balls to obtain a spicy cocoa flavor. On the other hand, when cacao is exported, the uncoated balls are opened, revealing the 30-50 smaller seeds inside which have to be dried & fermented, then roasted and ground. More on cocoa another day. The photo of the smaller display baskets inside the larger one shows cocoa seeds on the far right at 3 o’clock. Also shown are mace at 12 o’clock, nutmeg seeds in the center, cinnamon bark at 5 o’clock, cloves at 7 o’clock, and bay leaves at 10 o’clock. Photo courtesy of Grenada Board of Tourism display taken with permission at the port Visitor Welcome Center. Nutmeg pods are called a pericarp consisting of a pale yellowish outer layer that was previously discarded, but nowadays is used in the production of nutmeg syrup, jelly, and jam. On the hard brownish nutmeg seed inside is a reddish-orangish lace coating which is the spice mace and is harvested separately (the islanders consider it to have a mild nutmeg flavor and they use it in baked goods such as cakes, doughnuts, and cookies). We were told the nutmeg seeds dry for 6-8 weeks and the mace coating that is removed is aged for 4-6 months. Reportedly, mace is graded into 3 categories, with prime mace being used in culinary seasonings, while the 2nd grade product is used in food preservation and the 3rd grade product is used in cosmetics. The mace I smelled there was quite pungent indeed! The photo shows the lacy mace surrounding the hard nutmeg seed shells. When nutmegs mature, the entire pericarp drops to the ground, making harvesting rather easy. Farmers remove the lacy mace and it is sold separately as a spice. 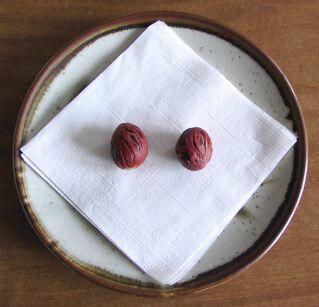 Nutmeg seed nuts are dried, cracked, and the thin, hard outer shell pieces discarded. The remaining hard nutmeg seed is then grated as needed. 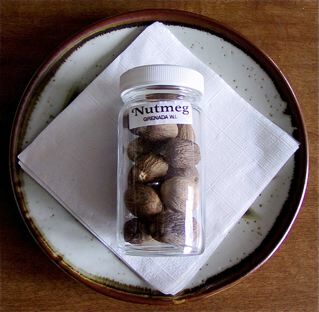 A mere pinch of grated nutmeg is used by the islanders to flavor egg nogs, milk drinks, rum punches, spiced hot wines, puddings and custards, roasted lamb, and sweet sauces. 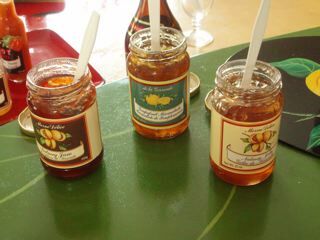 At an island factory (De La Grenade Industries) for jams and jellies, nutmeg syrup, nutmeg jam, nutmeg jelly, guava jam, guava jelly, ginger root syrup, mauby syrup (a concentrate made from boiling buckthorn tree bark with sugar and a variety of spices & flavorings that may include cinnamon and vanilla), and a seamoss concentrate that already has spices in it (that the islanders then mix the concentrate with sweetened condensed milk) were available for sampling. The staff prepare tiny pancakes when any visitors to the factory arrive for them to apply the various syrup products to for taste testing purposes, or one can try them solo. Crackers are available for trying the jams and jellies on. The best cinnamon comes from the inner bark of the cinnamon trees. 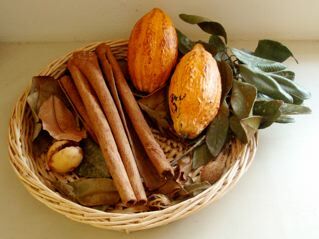 Cinnamon is used by the islanders to flavor beverages such as hot chocolate, cocoa based alcoholic drinks, and hot toddies made with fruit juices. They also used it in baked goods including cakes and cookies, pudding, cereals, sweets, sauces, jams, jellies, pickles, relishes, vinegars, soups, gravies, and mix it with tea or use it alone to make a spicy hot tea. Bay leaves are allowed to dry and are then used whole or sometimes ground to flavor stews, soups, gravies, savory rice, salad dressings, poultry, fish, marinades, spiced vinegars, other condiments, porridges and pastas. Visiting the parishes in the hills of Grenada where the temperature is much cooler than down in the port city of St. George’s allowed us to also enjoy seeing waterfalls, foliage in bloom, and take in the full aroma, and other sights and sounds of the spice island–it is so very peaceful farther up into the hills! 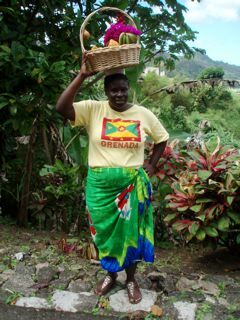 It also gave us the opportunity to meet a number of its warm hearted people, some of whom were shy and didn’t want their photo to show up on a blog site, but as it happens, the woman depicted below gave us her permission as she caters to the tourist trade, as do so many other islanders. Hopefully we will have the opportunity to visit the Isle of Spice again at a future date–it is simply a sensory delight!